One of the biggest challenges to keeping pet turtles is satisfying their space requirements. Though not as popular as larger turtles like red-eared sliders (Trachemeys scripta elegans) and painted turtles (Chysemys picta), mud turtles (Kinosternon sp.) are small and therefore, much easier to cage. While stock tanks and outdoor ponds are suitable housing for mud turtles, aquariums provide better visibility for observing their endearing behaviors. At least 15 different turtle species called mud turtles belong to the genus Kinosternon; taxonomy is in flux. Musk turtles are closely related. Though most species are nocturnal in their natural habitat, captive mud turtles may be active during the day or night. All mud turtles are omnivorous scavengers who feed on invertebrates, small fish, carrion and vegetation; in captivity a broad diet of insects, mollusks, fish, commercial pellets and fruit is appropriate. Mud turtles are typically found in ponds, swamps and rivers with little to no current and sandy or muddy substrate. Though they swim well, mud turtles spend a lot of time walking around the bottom of their habitat. They've been found on land, some distance from water. With some species emerging from their eggs at less than an inch in length, mud turtle hatchlings are among the smallest turtles in the world. Because of their size, hatchling mud turtles don’t require large accommodations. A pair of hatchlings can be kept together in a 20-gallon aquarium until they double in size. When choosing an aquarium, realize that it is more important to maximize the floor space than depth. Mud turtles don’t require very deep water -- 4 inches is enough for hatchlings -- as most of their activity will take place in the horizontal plane. Aquariums that are designated as breeder tanks or “long” are better suited for turtles than typical aquariums that emphasize tank depth. 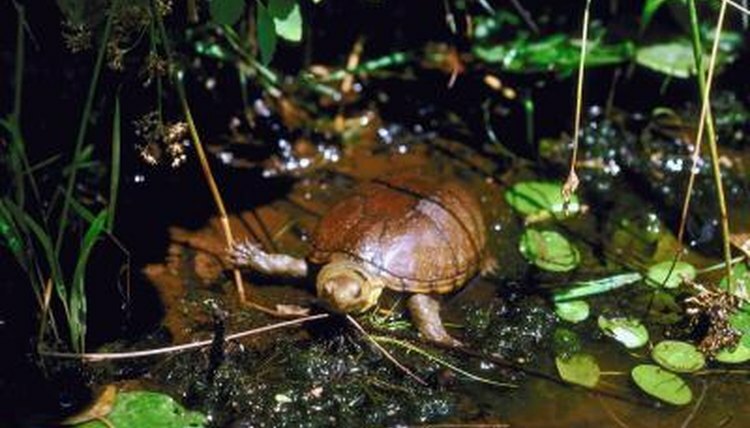 While much larger than the hatchlings, adult mud turtles are still small. They eventually reach 4 to 6 inches in length. While it is possible to maintain a pair of adults in a 20- or 30-gallon enclosure, mud turtles will use and appreciate much more space than this. A good rule of thumb for most turtles is to provide approximately 10 gallons of cage space for each inch of turtle length. A 75-gallon aquarium with about 12 inches of water depth would be ideal for a pair of adult mud turtles. Of course, don’t be afraid to provide an even larger aquarium if space permits. Mud turtles are active scavengers. They will benefit greatly from submerged caves, logs and aquatic plants. As these turtles are apt to dig and root around underwater, they will stir up a lot of debris, necessitating powerful filtration. Be sure that any props used in the aquarium won’t shift and trap the digging turtles inside. Additionally, related musk turtles need a dry area to haul out of the water and bask under a heat light. Both mud and musk turtles are known to be good climbers, so it is essential that a quality screen top is used over the aquarium.